1. 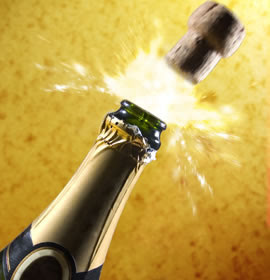 To be called Champagne, it must come from a northeasterly region in France called…..surprise…..Champagne! 2. It must be made in a certain method called methode champenoise. These are the basics: Champagne undergoes two rounds of fermentation, the second fermentation occuring in the bottle and with the winemaker adding several grams of yeast and some sugar to each bottle. At this time the champagne bottle is capped. The bottles are then placed in large crates in such a way that the bottle can “age on their lees“, or rest horizontally on the residual yeast in the bottle . This bottles must rest on the lees for at least 15 months but can be kept like that for up to 8 years. After this the bottles are riddled, or in french remuage, which is “a process in which the bottles are placed on special racks called pupitres. This places the bottles at a 45º with the cork pointed down. Every few days the bottles are given a slight shake and turn and dropped back into the pupitres (eventually the angle is increased). The drop back into the rack causes a slight tap, pushing sediments toward the neck of the bottle. In about 6 to 8 weeks the position of the bottle is pointed straight down with sediment in the neck of the bottle.” (wiki) After this the neck of the bottle is then frozen, and the cap removed. The pressure in the bottle forces out the lees, a process called disgorging, dégorgement in French. Immediately after some sugar is added, this step is called Dosage, and the bottle is then quickly corked to maintain the bubbles. 3. The main grapes used most commonly used to make Champagne are Chardonnay, Pinot Noir and Pinot Meuniere. 4. Little known fact: Champagne first gained world renown because of its association with the anointment of French kings. 5. Little known fact: It was claimed that the famed monk, Dom Perignon, invented champagne. However he did not. The English scientist and physician Christopher Merrett documented the addition of sugar to a finished wine to create a second fermentation and presented the Royal Society with a paper in which he detailed what is now called methode champenoise 40 years before it was claimed Dom Perignon did. RM: Récoltant manipulant. A grower that also makes wine from its own grapes (a maximum of 5% of purchased grapes is permitted). Note that co-operative members who take their bottles to be disgorged at the co-op can now label themselves as RM instead of RC. Vintage (199? ): is made only from grapes harvested during a specific year where the grapes had exceptional growing seasons and it is aged longer than non-vintage Champagne. Premium vintage or prestige cuvée: made using only the best grapes from top vineyards for that year and the Pinot Meunier variety is often left out. Rose – This style of Champagne gets its pink color by either by leaving the clear juice of black grapes with the grape skins for a brief time or, more commonly, by adding a small amount of still Pinot noir red wine to it. Well my wine loving friends…This is where we stop for this lesson. Next time we will move on and learn about the “The Other Sparkling Wines”! May your glass always be filled with the sparkling joy of Champagne! !